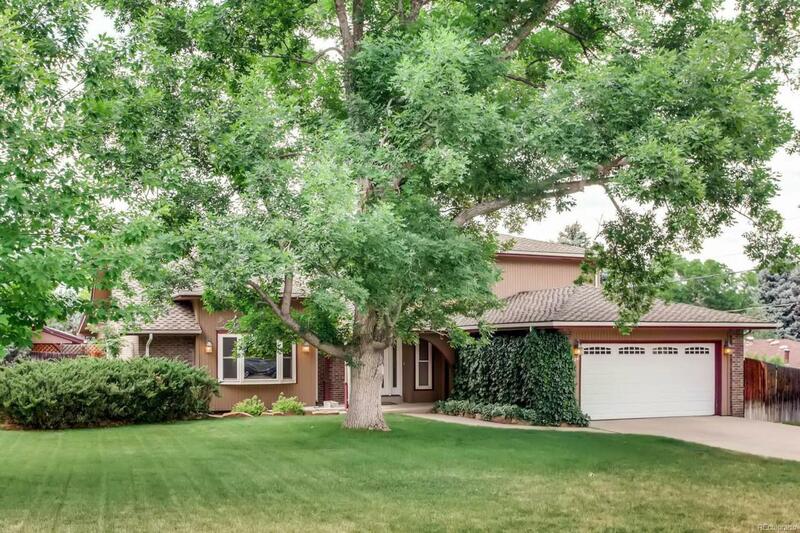 Outstanding updated two story in Columbine Knolls. Amazing 1/4 acre lot with beautiful landscaping. Fabulous family room addition with wall to wall windows over looking extensive gardens and gas fireplace. Updated kitchen with slab granite counter tops, hickory cabinets w/ under cabinet lighting and breakfast bar. Tile and hard wood floors. Main floor study, formal living and dining rooms. Extraordinary 27 foot long walk in master bedroom closet plus spa like shower with steam and three sprayers. Amazing outdoor living space; covered patio with multiple fans, Tiki Bar, storage shed. Sprinkler and drip system water all the gardens. All appliances stay. Huge basement w/ many built-in storage cabinets.